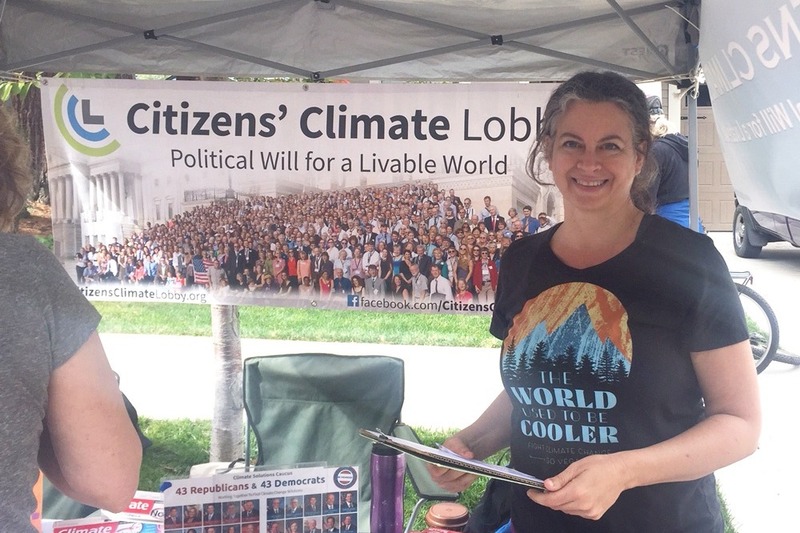 Why I support Citizens’ Climate Lobby (and how you can too)! We are already up to 45 Republicans and Democrats less than a month after this photo was taken. After the Climate Reality Training, I felt inspired to take action and join some local groups, one of them is Citizens’ Climate Lobby. After attending my first meeting, I was impressed with the organization and approach. It was especially gratifying that it is a grassroots, nonprofit bipartisan solution to fight climate change at a national level. CCL has created a House Climate Solutions Caucus in the US House of Representatives which will explore policy options that address the impacts, causes, and challenges of our changing climate. It has grown to 90 members already, joined in pairs- Republican and Democrats together. Their main climate solution is a carbon fee and dividend. While it seems complicated to explain, it’s actually quite simple. Basically, the carbon fee places a price on carbon at the point of extraction (mine, well, or port of entry). This will start at $15/metric ton and increase each year. All the money collected will be distributed to households as a monthly dividend. This will cause consumers to be more aware of the price of carbon choices, and hasten the move to less expensive and cleaner renewable energy. How will this help with Climate Change? Republicans should appreciate that it does not increase the size of government, require new bureaucracies or directly increase government revenues. As part of implementing this policy, CCL trains and supports its volunteers in many ways. I had mentioned in the last post how incredibly motivated I have been to work on climate change efforts, so I jumped in as usual and started getting signatures, and even helped at a booth right away. I received a call soon after asking if I would like to join the NW chapter of CCL headed to Washington D.C. in November after the midterm elections to make sure our Representatives know that Climate Change is a priority issue. The head of our chapter told me they like to have at least one new member go on these trips. I had marked on the form passed around in my first meeting that I was interested but would need financial help to attend. CCL would have a small stipend to give me if I could raise the majority of the money myself. I told them I needed to think about it for a few days. It’s not cheap. Based on sharing a room for three nights and using some of my miles, it would still cost over $800 at least to attend (not even counting the meals on my own). I didn’t feel excited about the idea of traveling to Washington D.C., or doing this type of political work. But, I am learning to overcome this type of fear and take action anyway. At one point, I had talked myself out of it since I really wasn’t comfortable asking for money on top of everything. Then I had a revelation of sorts, “this is not really even about me”. I am not going to Washington D.C. because I want to, or for enjoyment, I am doing it because I believe this is one of the best shots at curbing carbon emissions for our future generations. Not to say that going on this trip will be a hardship, there will be new people to meet and skills to learn. It has been called a life-changing experience. I’m embracing the idea of saying yes to things that push me, and it keeps opening up more opportunities. So, here I am over half way to my fundraising goal of $650. There is no turning back now — the 10 friends and family members who have contributed to this trip are now part of this mission, and I can’t thank them enough for their support! I’ve committed to CCL that I will attend, but have not reached my goal yet. If you would like to make any size donation, you will be part of making this happen. And I will do my very best in every way to make this trip successful. There is simply too much at stake for anything less. Take a look at the Fundraiser here.